Happy Easter! We’re not terribly religious around here, but we do take time to celebrate the major holidays, Easter being one of our favorites. 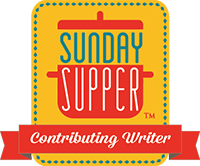 This week’s #SundaySupper is all about the holiday feast, and Alaiyo over at Pescetarian Journal is hosting. 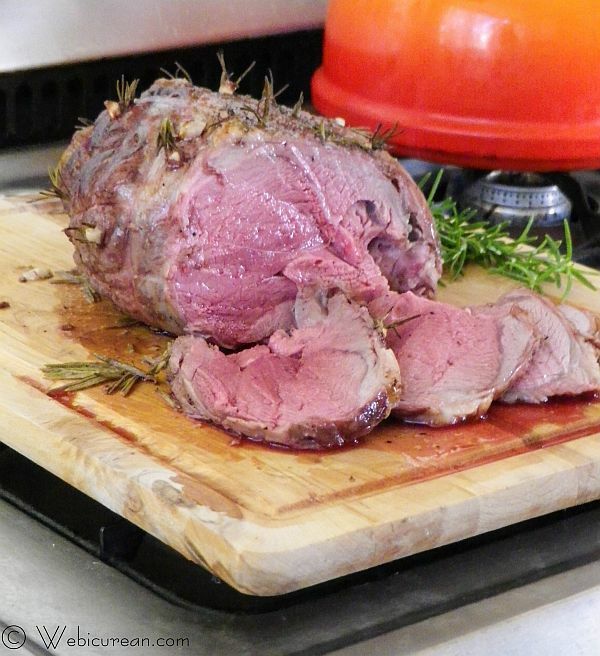 Occasions such as this bring the family together and deserve a special meal, so I’ve whipped up this leg of lamb that has been roasted with white wine and garlic. The rosemary potatoes cook around the lamb to soak up all that lamby goodness. Originally I intended to prepare for you my favorite ham and scalloped potatoes recipe, but I ended up tabling that plan since the family wanted that for the actual holiday (which we celebrated yesterday).Â As it turned out, we were in 16 for dinner, so rather than making my scalloped potato recipe, I used my mom’s, which served more (plus it had been ages since we had it). Have you ever encountered a potato that refused to cook? Every once in a while this seems to happen. I had everything timed to come out of the oven at 5:00 p.m., but the potatoes would have none of that! The problem may have been that my mom’s 20+ year old convection oven no longer has the umph to cook such a big dish, but two and a half hours later, they were finally done. Fortunately everyone agreed they were worth the long wait! The ham, of course, was perfection, despite the fact that it was an hour in before I realized I hadn’t removed the little plastic cover from the bone. You’d think it was my first rodeo, and it just goes to show even experienced cooks blunder from time to time. I’m looking forward to the leftovers though–the ham will be used in this crazy good mac and blue cheese with ham recipe and the bone is going in my Mom’s Savory Pork & Beans. Meanwhile, days earlier, we enjoyed this roasted leg of lamb for an early Easter dinner. Also my mom’s recipe, slits in the lamb are stuffed with garlic and rosemary, allowing the flavors to permeate the meat, and the whole thing is roasted in a pan of white wine. The potatoes get parboiled, so they’ll cook quicker. Then they get tossed with melted butter and rosemary before going into the pan. Later, while the lamb is resting, the potatoes finish off at a high temp just to crisp them up. All you need is a salad and a good bottle of wine, and you’re all set. Pat the lamb dry, and begin piercing the bottom side of the roast with the tip of a sharp knife. Note, the roast is actually right-side up in this picture. Stuff the slits with slivers of garlic along with a few rosemary leaves. Sprinkle with salt and pepper. Once the bottom is done, flip the roast right-side up (pictured here), add the wine to the pan, then finish dressing the lamb with the garlic and rosemary. Sprinkle with salt and pepper, then place in the oven for 30 minutes. Meanwhile wash and halve the potatoes, then boil in a pot of salted water until a fork can be inserted into the flesh (but not fully cooked). 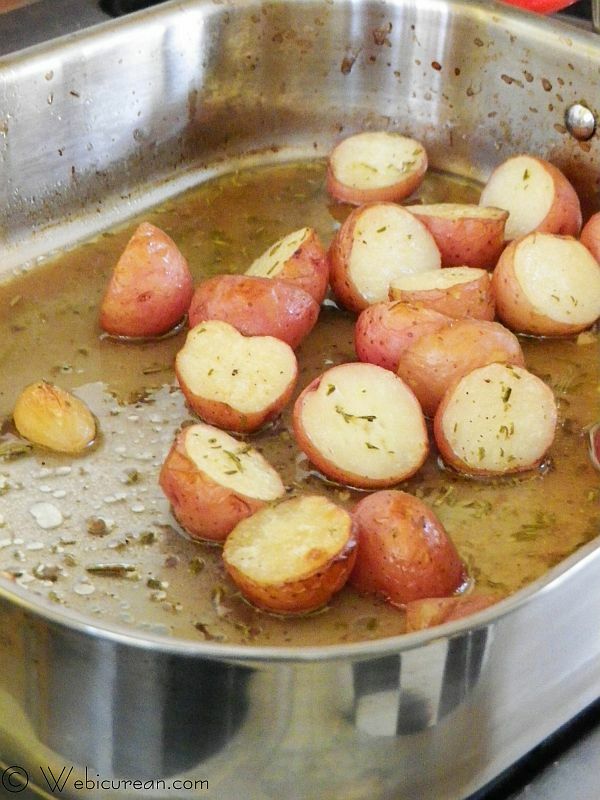 Drain the potatoes and toss with the melted butter, rosemary, salt and pepper. Remove the roast from the oven, baste it, then add the potatoes around it in the pan. Return to the oven for an additional 30-40 minutes. 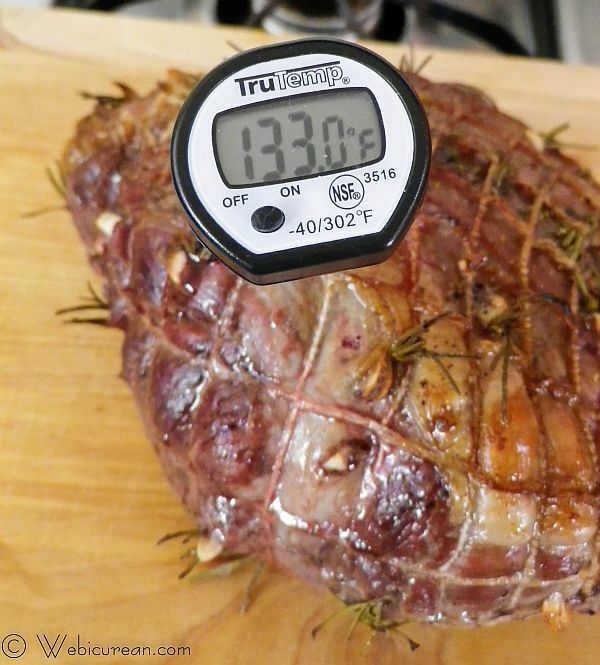 Remove the roast from the oven about five degrees below the desired doneness, and allow it to rest for about 15 minutes. Crank up the oven to 450F, and return the potatoes for another 20 minutes or until they start to crisp up. 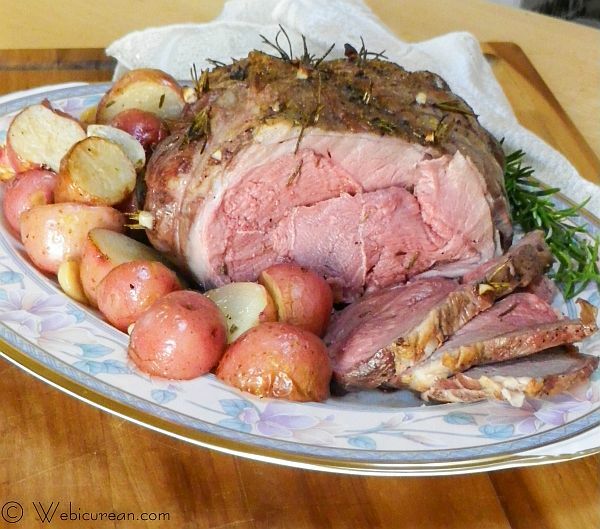 Boneless leg of lamb is roasted with white wine and garlic and rosemary potatoes for a special Easter dinner. Pat down the roast with paper towels. 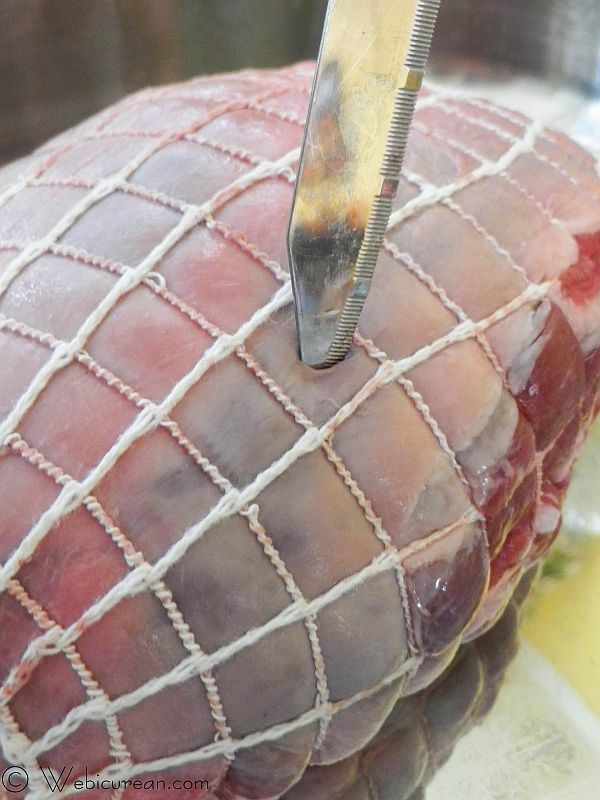 Do not remove the butcher's netting as it's holding it together! Starting with the bottom side of the roast, pierce small slits into the roast all over with just the tip of a sharp knife (see pictures). Cut the garlic into small slivers, and stuff one into each slit. Break off the rosemary leaves, and stuff into the slits with the garlic. Sprinkle with salt and pepper, then place in your roasting pan right side up. 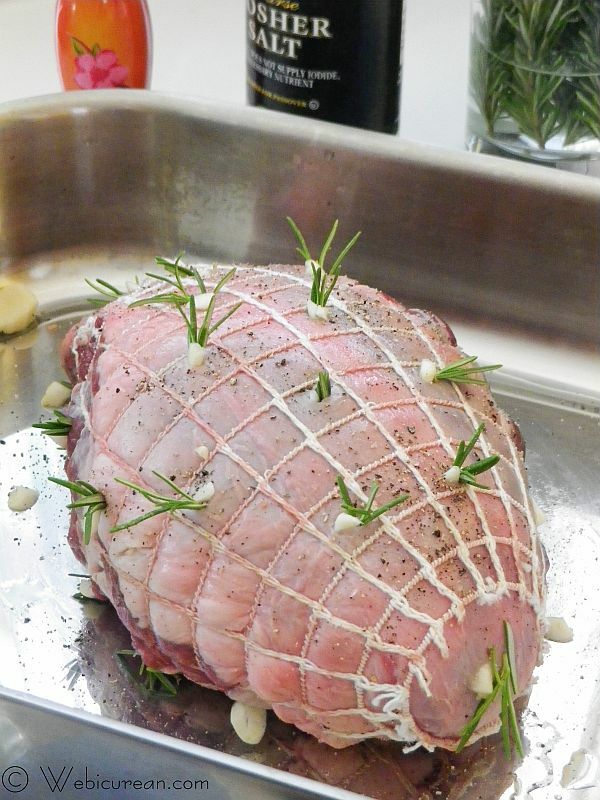 Pour the wine over the roast, then continue piercing slits into the top and sides of the roast, stuffing with the garlic and rosemary as you go. The roast will look like it's sprouting trees, but this really gets the flavors into the meat. Sprinkle the top with salt and pepper, then place in the oven for 30 minutes. While the lamb is cooking, rinse and cut the potatoes in half, then bring to a boil in a pot of water. 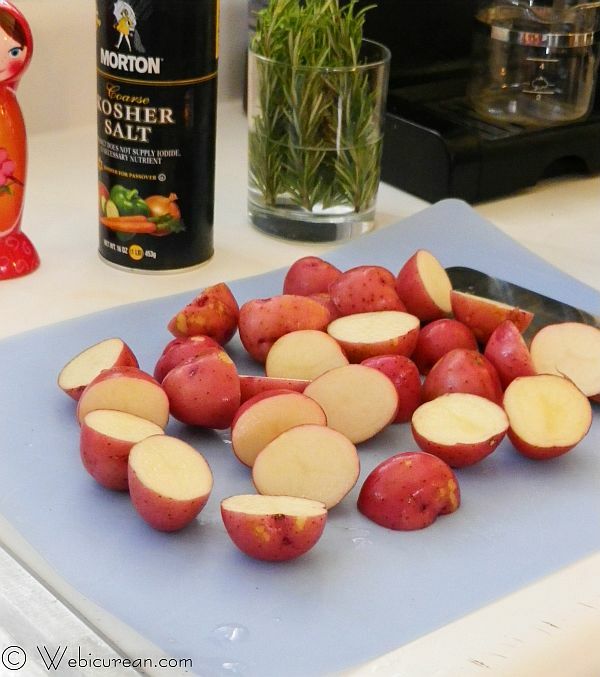 Cook only until the potatoes can be pierced with a fork, being careful not to overcook. 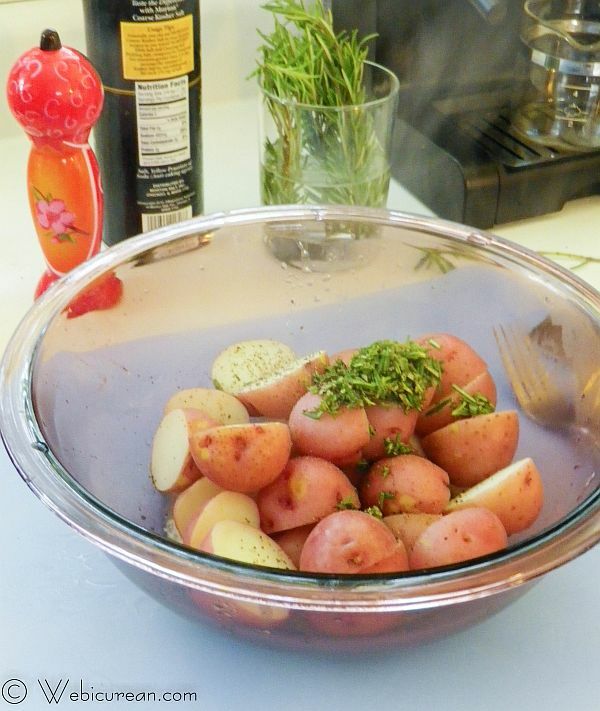 Chop enough rosemary to make 2 tablespoons, then in large bowl, toss the potatoes with the rosemary, melted butter, kosher salt, and a few twists of the pepper mill. At the 30 minute mark on the roast, remove it from the oven to baste, then add the potatoes around the roast in the pan. Return to the oven and cook an additional 30-40 minutes until the desired doneness is reached. For rare, that's 125F; medium-rare is 130-135F; medium is 135 to 140F; and well done is in the 155 to 165F range. Since the meat will continue to cook while it's resting, figure on taking it out of the oven five degrees below the desired doneness. Remove the lamb from the oven, and allow it to rest on a cutting board. Meanwhile, increase the oven temp to 450F, and return the potatoes to the oven for another 15 minutes or so until they start to crisp up. 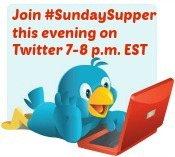 Twitter how-to:Â Follow theÂ #SundaySupperÂ hashtag throughout the day on Twitter to see our recipes. 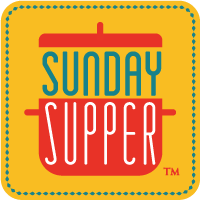 To join the conversation anytime, simply use theÂ #SundaySupperÂ hashtag to share your favorite tips and recipes. Pinterest: Check out ourÂ #SundaySupper Pinterest boardÂ for more recipes and photos. Join:Â To join the Sunday Supper Movement, sign up by clicking here â†’Â Sunday Supper Movement. That is stunning, love it and would love it for Easter dinner!! Thanks! It really was a treat–I need to cook lamb more often. Happy Easter! We love roast lamb and that looks just perfect! I think I’ll need one of those this week. Think of all the yummy sandwiches you can make with the leftovers! oh my goodness!!!! That roasted leg of lamb is a BEAUTY!!! How lovely and delicious! Happy Easter!! Thanks! It disappeared quite fast too! The time must come for me to finally conquer lamb; DH has been asking for years now and it just never felt right but looking at your awesome recipe!!! Well, it just changed my mind. YUM! The thing to remember is that lamb is super tender and hard to mess up! You might want to cook yours a little longer, so you’re not starting with something so rare … but truly, lamb is pretty easy to cook! Your lamb looks fabulous! It makes me want to try some and I’ve never been a bit lamb fan. The rosemary and garlic studs really set it off! Thanks! You know by doing the garlic/rosemary that way, the flavors really permeate the meat! This is so beautiful! And looks so delicious. And yes, I’ve met those stubborn potatoes, too; don’t they always seem to show themselves only when you have company? We aren’t very religious at all either but do love celebrating holidays. Really any excuse to get together with family over a great meal is a good thing in my books. I love using fresh rosemary with lamb, not only does it give wonderful flavour but I love the presentation it gives. Love what a great dinner this is with so few ingredients! Yummy!! Thanks! You really can do a lot with a little garlic and wine! This looks deliciously perfect! Indeed a great recipe.